A second season of Into the Badlands is looking more likely. At the TCA winter press tour this past weekend, The Hollywood Reporter’s Lesley Goldberg tweeted that the martial arts drama would be renewed for a second season. Into the Badlands freshman season premiered on November 15th, 2015. Created by Al Gough and Miles Millar, the drama follows Sunny (Daniel Wu), a seasoned killer and martial arts expert who lives in a futuristic feudal society. A second season renewal seems likely. The first season did well in the ratings, with an 18-49 demo average of 1.79 and an average of 3.86 million viewers per episode. What do you think? 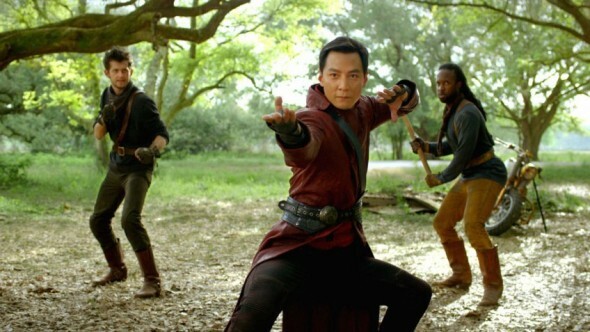 Are you a fan of Into the Badlands? Would you like a second season? More about: AMC TV shows: canceled or renewed?, Into the Badlands, Into the Badlands: canceled or renewed? Into the Badlands: Second Season Renewal for AMC TV Series? Please do a second season both hubby and I loved it. Please allow a season 2 it’s a one of a kind show very different than the normal I love it.. I can’t wait for the series to return. I LOVED the first season. Please let it come back. There’s nothing else like it on TV. I love the series. Bring on season two I’m waiting impatiently.